Google Algorithm Update On April 17th & 18th? 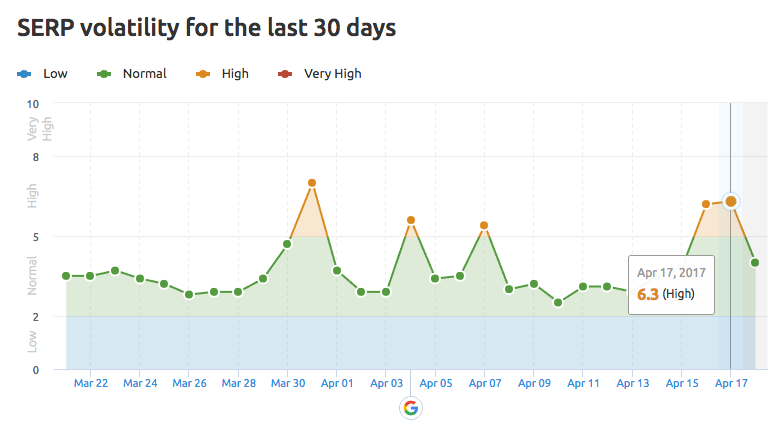 Home > Google News > Google Updates > Was There A Google Algorithm Update On April 17th & 18th? Was There A Google Algorithm Update On April 17th & 18th? So, while I was offline, there seems to been a Google algorithm update. Not at Fred, Penguin or Panda levels but an smaller but yet significant update that caused both a lot of chatter in the community as well as set most of the automated tracking tools off. Whatever they did yesterday has already been changed. Tuesday was a good traffic day, today's has been switched off across multiple sites both local and global ... wtf? Of course its possible that the folks at Google don't like the results of Fred Update. Therefore the current roll back! If that is the case, we should expect an update or a refresh soon. Seeing big rank and traffic surges across my network last 2 days. Something deffo happening here. There is definitely some shift going on, I monitor 100s of sites across the board, 2 sites that lost ranking the last updates recovered slightly better than before..
Have you noticed any significant changes with your client or your own rankings in the past couple of days?